I consider Calhoun a brilliant but tragically underappreciated author. 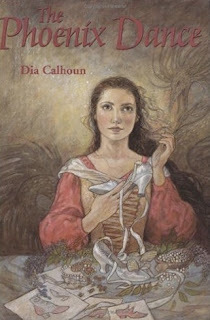 I first discovered her when I read AVIELLE OF RHIA, a unique and spellbinding young adult fantasy that I bought at a word-of-mouth only (and very hard to find) book sale several years back. THE PHOENIX DANCE convinced me that Calhoun didn’t write one fluke of a gem with AVIELLE but has a real gift for story, character, and theme. THE PHOENIX DANCE is a twist on the classic tale of “The Twelve Dancing Princesses” as well as a well-rendered metaphor for manic depression. Young Phoenix wants nothing more than to apprentice for the queen’s own shoemaker and learn the skills to design and bring to life her own gorgeous shoe creations. Sadly, what her aunts call her “flighty moods” make it difficult for her to be a reliable worker. One day she’s buzzing with excited energy so intense she rushes around producing more quantity and quality than anyone thought possible in such a short amount of time. Then the next day she may feel so wiped and unmotivated that she can’t leave her bed. Aside from Phoenix’s personal problems, the royal shoemaker starts losing the queen’s respect when all twelve princesses completely wear out their new shoes in one night. Determined to help the princesses, the shoemaker, and herself, Phoenix resolves to find out what’s really happening to the princesses each night. I caught the manic depression parallels pretty early on and the themes become stronger as the novel progresses, but if I had any doubts Calhoun erased them with her note at the end announcing the deliberate metaphor and discussing real life bipolar disorder. In Phoenix’s world it’s called the Illness of the Two Kingdoms. Manic phases are referred to being in the Kingdom of Brilliance, which can be dangerous because people don’t know their own limitations and feel invincible and also because it leads to being in the Kingdom of Darkness, the depressive phase. A medic works with Phoenix on crafting a potion unique to her that will help ground and stabilize her, but Phoenix resents the potion for several reasons. For starters, it has unpleasant side effects like acne, weight gain, and nausea. For another, as much as Phoenix wants to avoid the Kingdom of Darkness she isn’t ready to say goodbye to the Kingdom of Brilliance. A steadier, balanced mood to her seems so bleak and boring. Sometimes she lies about skipping her potion or experiments with dosages despite the medic’s recommendations, in the hopes of finding a balance between her addictive manic highs while still avoiding the depressive lows. THE PHOENIX DANCE only further convinced me that I need to find and read everything I can by Dia Calhoun as well as continue to talk up this underappreciated author to anyone and everyone who will listen.